The main trigger (cause) for adult acne is a hormonal imbalance when the excess of some hormones (usually androgens) will cause the sebaceous glands to over produce the sebum - starting the acne cascade. 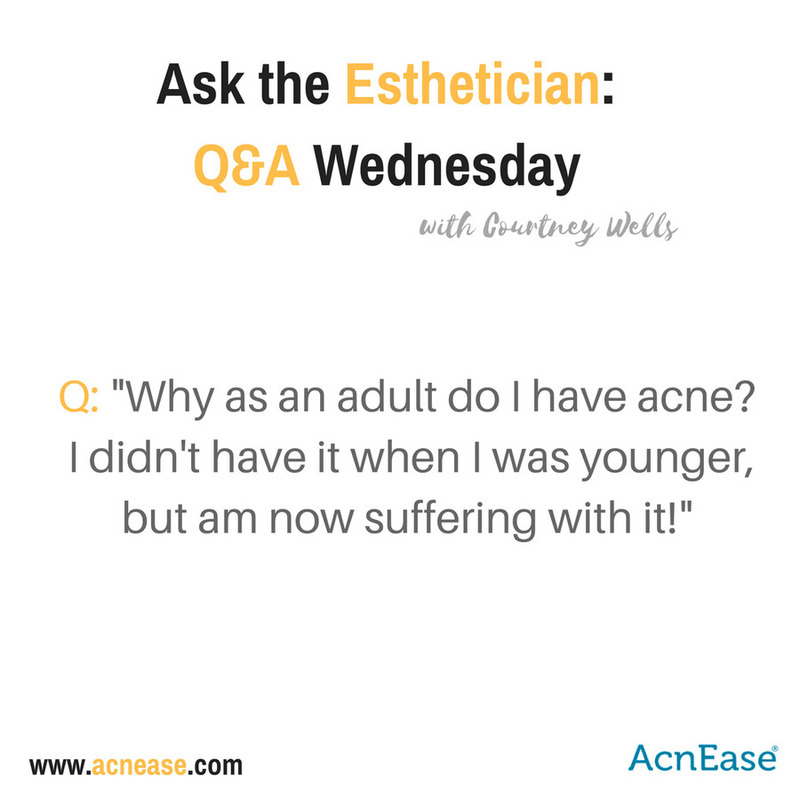 This has to be addressed internally and as many of you know, AcnEase does exactly that. There are also additional factors that may exacerbate acne, and this is what I want to talk about today. Usually my clients with adult acne are suffering with high stress. The stresses of life increases with age as more responsibilities pile on and our lives become more complicated. People get frustrated with this answer. Either they don’t believe this could be the cause, or they don’t know how to effectively lower their stress levels or even fit in the time to do so. I encourage all of my adult acne sufferers to incorporate many effective tools into their lifestyle like daily restorative yoga, or a weekly cranial sacral massage or morning meditation (check out the headspace app). Besides stress, diet can play a big role in adult acne. Many people begin to develop more sensitivities and allergies as they age, and I have seen a direct correlation between acne and diet. Food allergies, even slight, trigger inflammation responses in the body, which encourage breakouts. Try getting an allergy test from your doctor to determine if you may be ingesting foods that cause an inflammation response. For example, some people can have a gluten or dairy sensitivity – both of which cause inflammation. So eliminating these things could not only assist in clearing your acne, but also prevent a lot of other problems in your system down the road! Adult acne needs to be cared for differently than acne in your younger years. As you age, your oil production decreases, so harsh topicals may not be the best solution for you - especially topicals that increase Inflammation and dehydrate the skin. I have seen suffers of adult acne develop worse acne with prescription topicals or harsh over the counter solutions such as a high percentage benzoyl peroxide. They don’t even realize that this is happening either – the symptoms may go away for a little bit but they always return! The main take-a-way with adult acne is this: the only way to fully treat acne is from the inside. As mentioned, this doesn’t have to be done with chemicals and treatments that have side effects. Decrease inflammation and feed your body foods and supplements that nourish. Adding AcnEase to your daily skincare regimen is a great way to treat the issue (since none of these suggestions alone will do that). Also, cut out processed foods and sugar. Find out if you have sensitivities to gluten or to animal products such as lactose from milk. De-stress! Make a commitment and carve out the time to nourish your mind and body. All of these things can make huge changes in your condition and in your overall life.